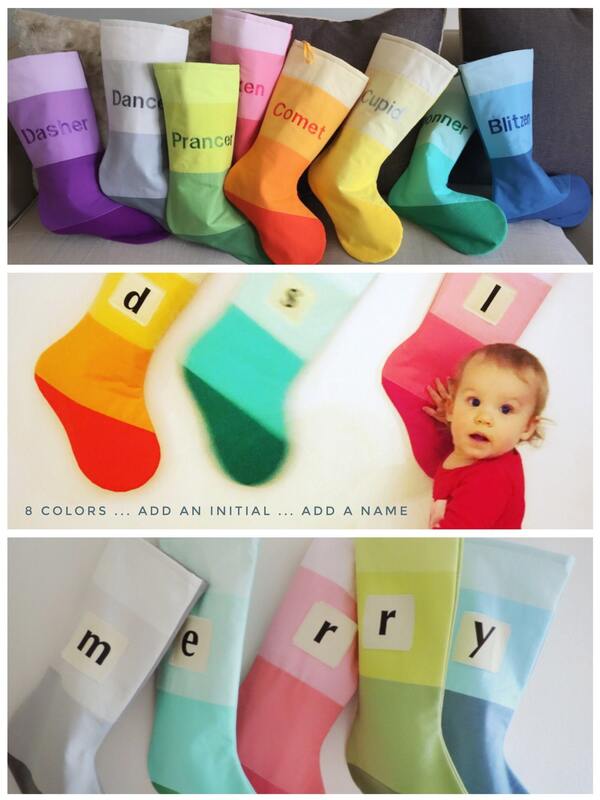 ... modern christmas stockings personalized for boys or girls ... striped colorblock christmas stockings in pink, teal, blue, green, purple, orange, yellow, silver gray ... personalized christmas stockings, monogram color block holiday socks ... Winter Wonderland Collection. 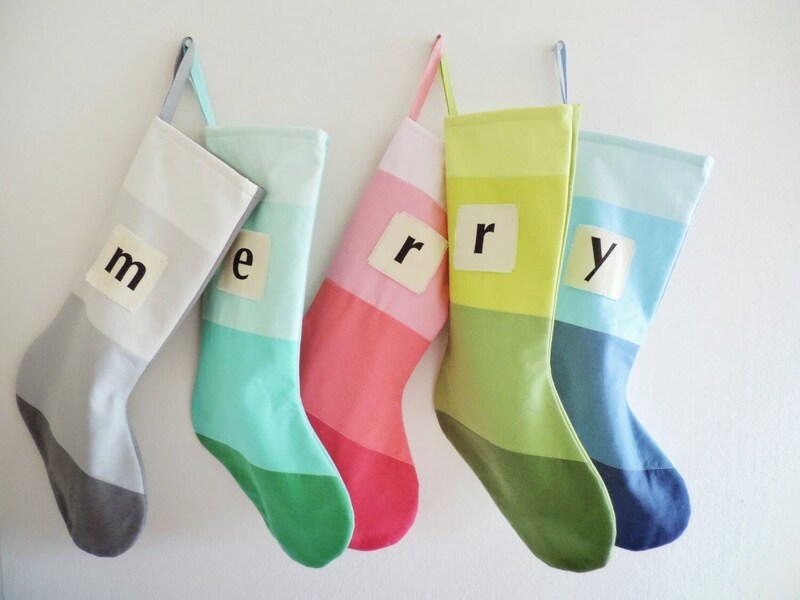 Introducing the 8 fresh and frosty Christmas stockings in my Winter Wonderland Collection. Reminiscent of frosty windowpanes, steamy mugs of peppermint tea, clear blue winter skies, and toasty toes before a warm winter's fire. 10 inches wide at foot. 8 inches wide at brim. Initials are printed onto cloth letter patches. 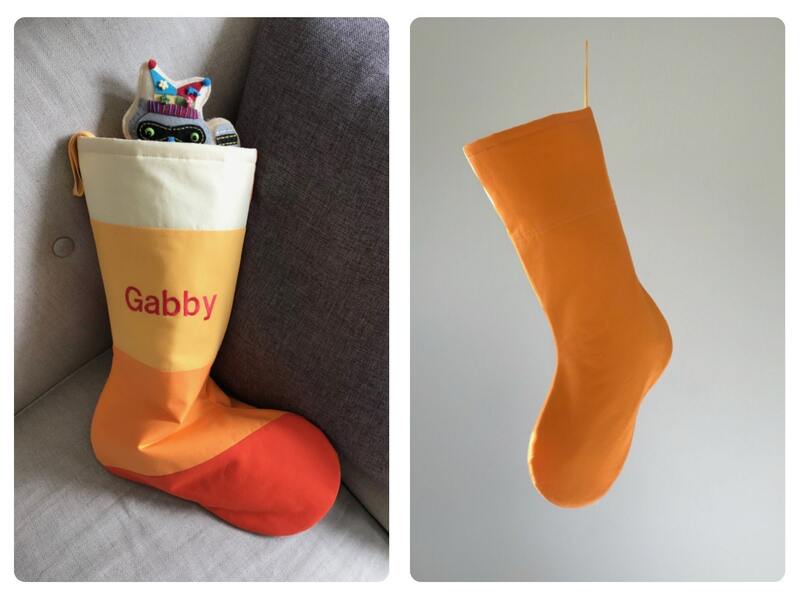 Full names are embroidered directly onto the stocking. Full names look best when 7 characters or less. Longer names will be reduced in size to fit. When personalized: spot clean only. press with a low iron if desired. When not personalized: machine wash cold, gentle. tumble dry low. remove promptly. reshape and press with a low iron. 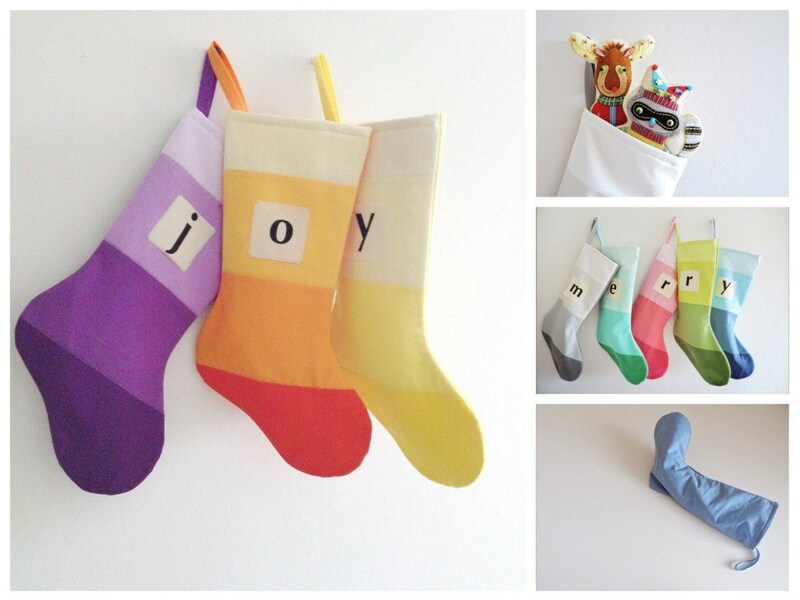 This listing is for ONE Christmas Stocking of your choice from my Winter Wonderland Collection. 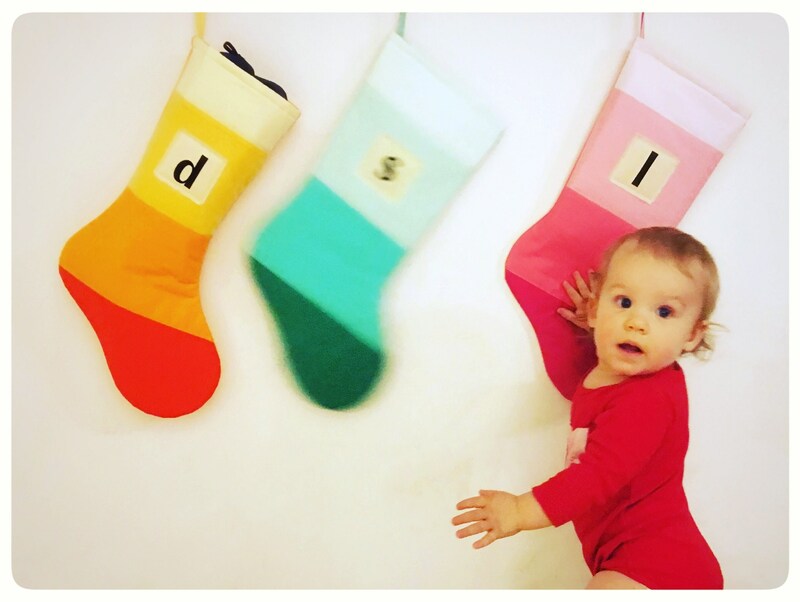 Stocking stuffers (sadly) not included. 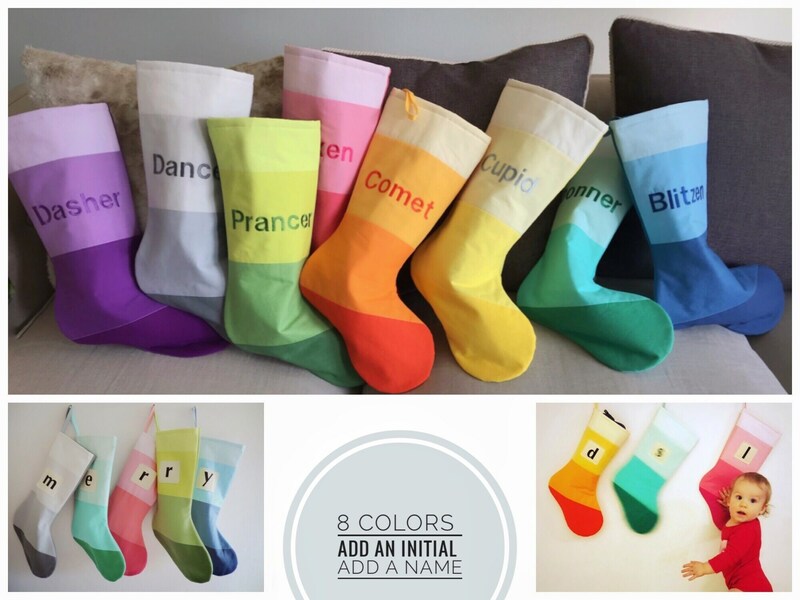 Use the drop-down menus on your way to checkout to select the stocking color and personalization you would like. 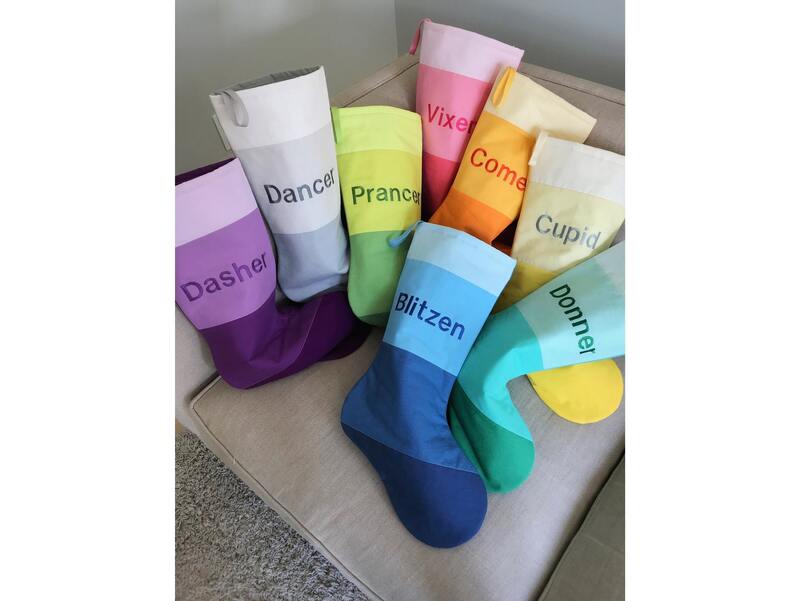 If you choose to have your stocking personalized with a full name, use the comments box during checkout to let me know the name you would like on it (perfect spelling please :-) See my shop policies and FAQs for additional important info. Is posted in the shop announcement at the top of my shop. About 1 week to most Canadian destinations. About 2 weeks to most American destinations. About 2-4 weeks if you live elsewhere. "Beyond expectations! Fast shipping, very friendly seller. 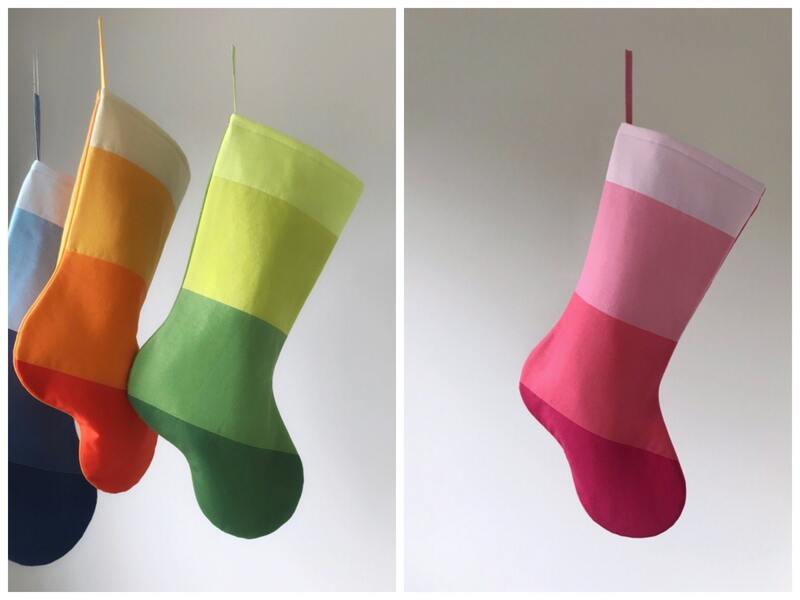 Would love to buy more striped stockings in different colors (purple please!!!)" ~ Catherine, Winter Wonderland stocking owner. As every order is handmade and involves labour and the purchase of materials, full payment is due at the time an order is placed. My payment processing is powered by Etsy and your payment information is secure. Shops using this system never receive your credit card information. Watch my shop announcement (at the top of my shop) for holiday order deadlines and my current turnaround time. Order deadlines are subject to change based on order volume. Holiday items are shipped according to postal guidelines for holiday delivery. DOMESTIC ORDERS: to destinations within Canada are usually shipped by Canada Post Expedited Parcel with a tracking number, insurance, and delivery in about 5-7 business days. AMERICAN ORDERS: to destinations in the United States are usually shipped by Canada Post Small Packet Air Mail with estimated delivery in 7-14 business days. This service does not include tracking. INTERNATIONAL ORDERS: to destinations outside of North America are usually shipped by Canada Post Small Packet Air Mail and estimated delivery varies. This service does not include tracking. If you require faster shipping, insurance, and/or a tracking number, contact me before purchasing for shipping upgrade options. Customs and postal delays are beyond my control. Shipment delivery dates are not guaranteed. You will receive a confirmation email from my shop when your order has been received by Good Wishes Quilts. You will receive another confirmation email when your order has shipped. Any duties, additional taxes, and customs fees associated with international orders are paid by the buyer. As all Good Wishes Quilts items are handmade and custommade, refunds, returns, and exchanges are not possible. I hope you are delighted with your purchase. If you have any concerns, please contact me and we will work out the best solution together. 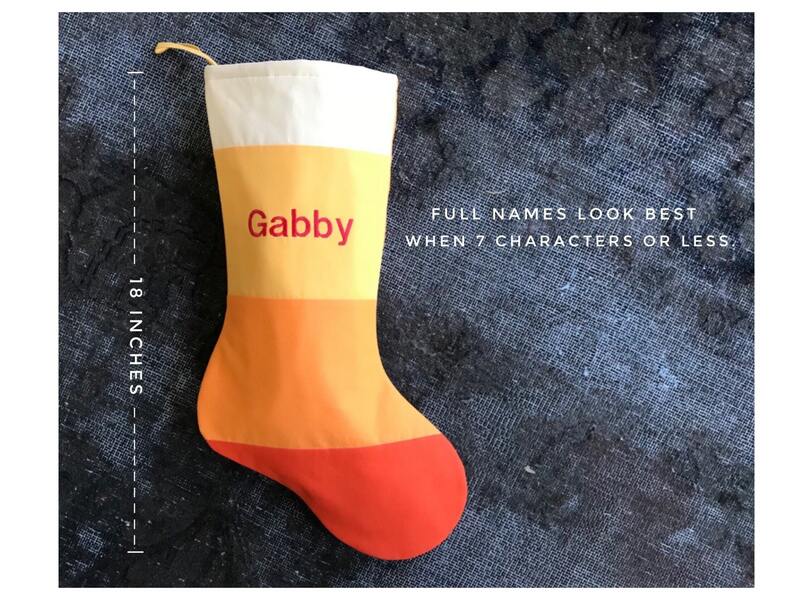 Should there be a spelling mistake in your personalized order, I will correct the error at no charge to you, for shipping or stitching, if the error was mine. If you had the misfortune of sending me an incorrect spelling when you placed your personalized order, please don't worry - you can send the item back to me at your expense for shipping, and I will correct the misspelled letters at a nominal fee plus return postage. As there is a cost associated with spelling mistakes, please double-check your spellings when you place your order for personalized items. My studio is located in Kelowna, British Columbia, Canada. It is smoke-free and professionally cleaned every 2 weeks. All Good Wishes Quilts product designs are ©Good Wishes Quilts 2010-17, all rights reserved. As such, these designs may not be reproduced without the expressed written permission of Good Wishes Quilts. Please see my shop announcement (at the top of my shop) for holiday order deadlines and my current turnaround time. Your purchase receipt will include an estimated shipping date for your order as well. It's always best to order early. Order deadlines may change based on order volume. Shipment delivery dates are not guaranteed because customs and postal delays are beyond my control. Rush fees and rush service are not available in my shop at this time. I'm a holiday shop, so all of my customers have the same delivery deadline. So, I stitch items in the order purchased, in order to be fair to all. Product sizes and measurements are provided in the listing for each item. Almost all Good Wishes Quilts products are made from materials of 100% cotton, a renewable resource. Most are quilted products. Care instructions are provided in the listing for each item. 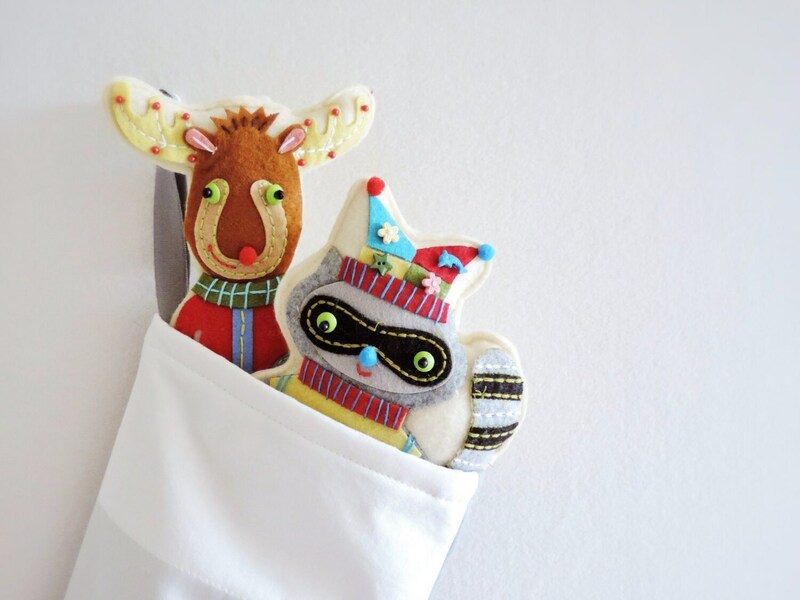 If your purchase is a gift for someone else, I'd be happy to include a gift note from you at no extra charge and/or ship the parcel directly to the recipient for you. > Enter the recipient's name and address as the shipping address if you would like the parcel shipped directly to the recipient. > Use the comments box during checkout to let me know the gift note you would like me to include. Also let me know if you do not want a receipt included in the parcel. Gift wrapping is available on request for a few dollars extra. Contact me before purchasing to request and purchase it. I do not have a wholesale program at the present time, but I may launch one in the future. If you would like me to contact you when I launch a wholesale program, just let me know. I'd be happy to. I respect your privacy. I will only use your contact information to communicate with you about your order, to fulfill your order, and for legal reasons (like paying taxes). What is a Good Wishes Quilt? Imagine wrapping yourself in a quilt of good wishes for your life. Then imagine giving a quilt like this to your own child, a family in need, or someone you love. That's a Good Wishes Quilt. It’s a wonderful tradition that started in northern China. When a woman learned she was expecting, she invited friends and relatives to each provide a small, simple gift: one patch of cloth, and a wish for her child's life. From these, the mother stitched a quilt for her child – a quilt that captured the luck, energy, and positive thoughts of all those who contributed to it. I love the whole idea of creating a precious family heirloom, filled with good wishes. And now, just as I wished, I'm in the business of doing just that. Choosing a size is more about the width of your tree than the height ... skirts look best when they reach out almost as far as the widest branches of the tree. The best way to choose your size is to hold a tape measure out where you would normally put your tree, and check the estimated width ... then order the size closest to that measurement.